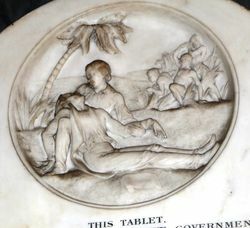 A marble tablet commemorates Edmund Kennedy and also pays tribute to the members of his ill-fated expedition to Cape York. Edmund Besley Court Kennedy (5 September 1818 – 23 December 1848) was an explorer in Australia in the mid nineteenth century. He was the Assistant-Surveyor of New South Wales, working with Sir Thomas Mitchell. Kennedy explored the interior of Queensland and northern New South Wales, including the Thomson River, the Barcoo River, Cooper Creek, and Cape York Peninsula. Kennedy was born on 5 September 1818 on Guernsey in the Channel Islands. He emigrated from England to New South Wales in 1840 becoming a surveyor. Kennedy died in December 1848 after being speared by Aborigines in far north Queensland near Cape York. On 29 April 1848 Edmund Kennedy and his men sailed out of Sydney Harbour in the barque Tam O' Shanter in company with the survey ship HMS Rattlesnake, for the journey to Rockingham Bay. Once landed, the party encountered terrible terrain such as mangrove swamps, mountains, lagoons, rivers and thick rainforest that made it almost impossible to travel. After two months, they had only travelled about 20 miles into the interior. The expedition separated into two groups. One group stayed behind, and the other group went north to meet the supply ship. On the way to the ship, one man shot himself and could not continue, so two men were left to help him. Kennedy and a young aboriginal man in the expedition called Jackey Jackey went on to try to find the ship. Kennedy was killed by aborigines near Cape York. He was only 20 miles from the ship. Jackey Jackey made it to the supply ship alone on 23 December 1848. Jackey Jackey held Kennedy in his arms as he died before showing the sailors where Edmund lay, then sailed back home. 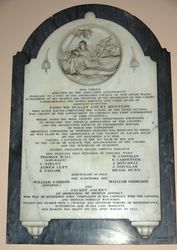 A Beautiful Marble Tablet has just been received from England for erection in St James' Church, commemorative of the fate of Assistant-Surveyor Kennedy and his party. The Tablet is white marble on a blue marble ground. On the upper part is a Medallion representing the death of Kennedy, whose figure occupies the foreground, supported in the arms of Jackey Jackey, beneath the shade of a palm tree-in the distance is a band of Aborigines hurling their spears. The whole is beautifully executed, and reflects great credit upon the sculptor, H Weekes, of London, and does honour to the promoters of the design. It can be seen at the Colonial Architect's Office. Sydney Morning Herald (NSW), 6 March 1852. EDMUND BESLEY COURT KENNEDY Who, After Having Completed The Survey Of The River Victoria, Was Chosen By The Government To Conduct The First Exploration Of York Peninsula, Where, After The Most Patient And Perservering Exertions To Overcome The Physical Difficulties Of The Country, And The Destructive Effects Of Consequent Disease, By Which The Expedition Originally Consisting Of Thirteen Persons Was Reduced To Three. He Was Slain By Aborigines In The Vicinity Of Escape River On The 13th December A. D. 1848, Falling A Sacrifice In The 31st Year Of His Age To The Cause Of Science, The Advancement Of The Colony, And The Interests Of Humanity. Flebile Principium Melior Fortuna Sequatur. An Aboriginal Of Merton District Who Was Mr Kennedy's Sole Companion In His Conflict With The Savages And Though Himself Wounded Tended His Leader With Courage And Devotion Worthy Of Remembrance, Supporting Him In His Last Moments, And Making His Grave On The Spot Where He Fell.